The clueless panda didn't know what to make of the snow, zookeepers said. Cute panda cub Bei Bei recently got his first snow experience at the Smithsonian's National Zoo in Washington, DC, ahead of the big blizzard on the way this weekend. Zookeepers allowed Bei Bei to "explore in a light dusting of snow" outdoors in a "small behind-the-scenes area" on Thursday while his mama ate breakfast, the National Zoo wrote on Instagram. However, the baby panda "wasn't quite sure what to make of the powdery snow and made his way back inside quickly," the National Zoo said. Bei Bei recently made his public debut this past weekend at the zoo. (Jose Luis Magana/AP Photo) Giant panda cub Bei Bei, seen through glass, roams in his pen at the National Zoo in Washington, Jan. 16, 2016. He and his twin were born to Giant Panda Mei Xang on Aug 22, 2015. 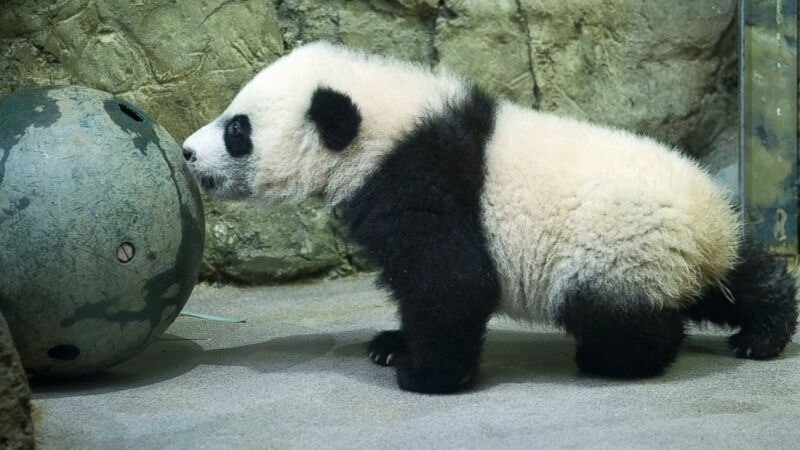 Unfortunately, Bei Bei's smaller brother passed away within a week. Bei Bei's name, which means "precious treasure," was announced by First Lady Michelle Obama and Chinese First Lady Peng Liyuan in September.